Prototype: German Federal Railroad (DB) type ABm 225 compartment car. 5 compartments, 1st class, 6 compartments, 2nd class. UIC-x design. Model: Era IV. The car has underbody details specific to this type of car. The trucks have brake shoes and a separately applied generator. The car has interior details. The car is ready for installation of the 66719 lighting kit, and the Marklin 73407 marker light kit. The minimum radius for operation is 356 mm / 14. Length over the buffers 282 mm / 11-1/8. 70 01 50 (Marklin) AC wheel set. The typical DB express train in Era IV consists of the cars under item nos. 24315, 24316, 24317, 24318, and 24319. 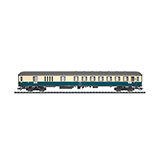 The UIC-x cars are available in the Marklin program under item nos. 43911, 43921, 43931, 43941, and 43951. Prototype: German Federal Railroad (DB) type BDüms 273 half baggage car. 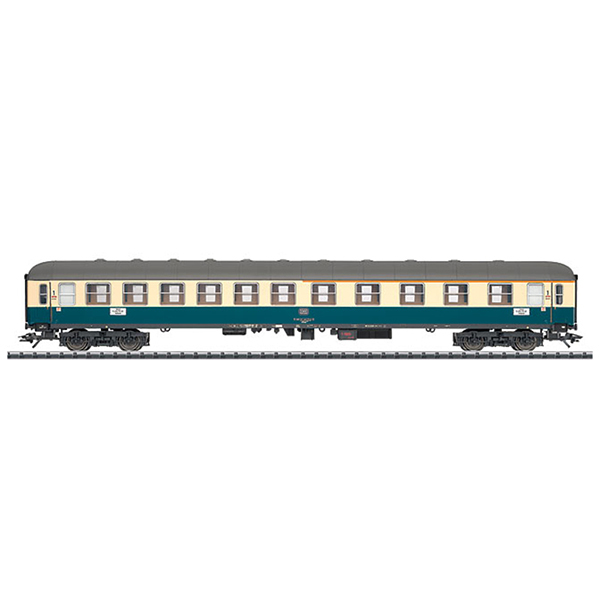 6 compartments, 2nd class, service area and baggage area. UIC-x design.